Team Suzuki Press Office – April 11. 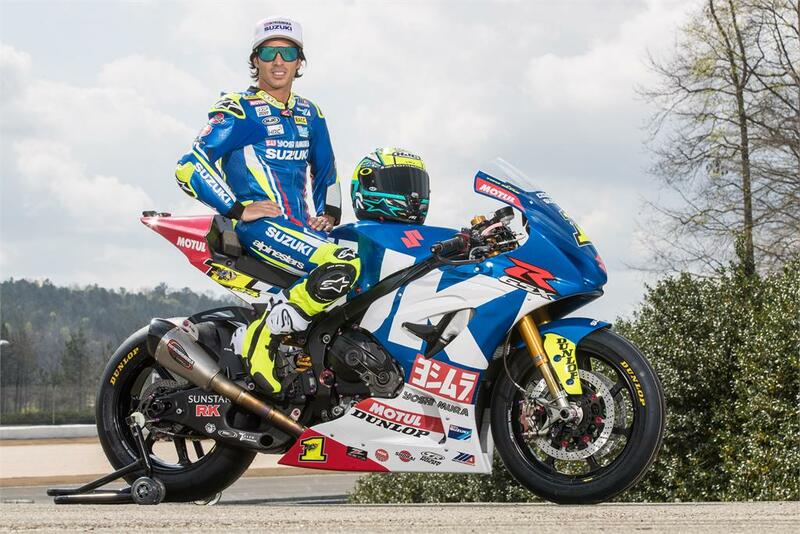 Yoshimura Suzuki Factory Racing’s Toni Elias begins his MotoAmerica Superbike title defence this weekend at the Suzuki Championship at Road Atlanta in Braselton, Georgia, with team-mate Roger Hayden, the 2017 series runner-up, also looking for a strong start to the 2018 season on one of the circuits he grew up racing at with his brothers. Both riders will be aboard the potent 2018 Suzuki GSX-R1000, the latest generation of the all-time winningest motorcycle in MotoAmerica/ AMA Superbike Championship history. Yoshimura Suzuki is coming off a highly-successful 2017 campaign, winning 13 of the 20 rounds and finishing first and second in the championship. Elias, scored 10 of those victories and wrapped-up the title before the final round. Hayden was the MotoAmerica Superbike Superpole master in 2017, winning a series-leading seven Superpoles, in addition to his three race wins. Hayden was also a title contender all year. This year, the Kentucky rider is hoping to lift the championship trophy at the end of the 2018 season. In addition to watching great racing, long-time fans of the series will have even more of an incentive to be on hand this weekend. Two-time AMA Superbike Champion and Motorcycle Hall of Famer Wes Cooley will be a special guest at the Suzuki Championship as part of Yoshimura Suzuki’s 40th Anniversary celebration. They’ll also get to see his historic 1979 Yoshimura Suzuki GS1000 Superbike; the machine he rode to the 1979 AMA Superbike Championship. In addition to the start of a new racing season, Yoshimura R&D and Suzuki Motor of America are celebrating the 40th Anniversary of their formal partnership. Launched in 1978, Yoshimura Suzuki became the all-time winningest team in MotoAmerica/ AMA Superbike Championship history. The pairing of Suzuki and Yoshimura has resulted in a series leading 14 championships and a remarkable 189 wins for the team.